Experience a beautiful boat ride along the Bosphorus Strait and Golden Horn and wander the Spice Bazaar on this 3.5-hour guided tour in Istanbul. 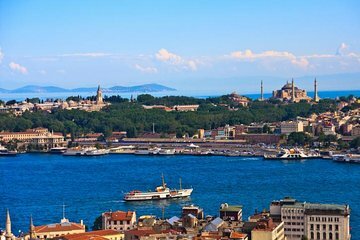 On this tour, you will discover the colorful Spice Bazaar and elegant Rüstem Pasha Mosque before spending the rest of the day sightseeing on the Bosphorus, a must-do in Istanbul. Explore the inlet to the Golden Horn which separates European Istanbul and capture amazing sights of Rumeli Fortress, Bosphorus bridge and Dolmabahçe Palace. With serene coastal views of the Old City it’s no wonder people can’t seem to put their camera down as they cruise the Bosphorus Strait. Starten Sie Ihre 3,5-stündige Istanbul Spice Bazaar-Tour und die Kreuzfahrt Bosporus und Goldenes Horn mit einer Abholung von Ihrem Hotel im Zentrum von Istanbul. Treffen Sie Ihren Reiseführer, steigen Sie in einen Luxus-Minibus und fahren Sie nach Sultanahmet, auch als Altstadt bekannt, um den bunten Gewürzbasar zu entdecken. Während Sie mit Ihrem Guide durch diesen belebten Markt spazieren, genießen Sie die wundervollen Aromen dieses im 17. Jahrhundert gegründeten Marktes. Erfahren Sie mehr über die Vielfalt an Gewürzen, Früchten und Nüssen, die die endlosen Arbeitsplatten dieser Stände und Läden säumen. Danach geht es weiter zur Rüstem-Pascha-Moschee und Sie erfahren, warum dieses kleine Gebäude von so vielen verehrt wird. Gehen Sie hinauf zur Moschee und bestaunen Sie die blauen Fliesen, eine wunderbare Ausstellung osmanischer Architektur. Fahren Sie anschließend eine kurze Fahrt zum Eminonu Pier und steigen Sie an Bord Ihres Bootes. Beginnen Sie Ihre Sightseeing-Kreuzfahrt mit dem blauen Wasser des Goldenen Horns, das das europäische Istanbul voneinander trennt. Da die meisten Kreuzfahrten nur auf den Bosporus gerichtet sind, können Sie das Goldene Horn sehen, das von sich aus spektakulär ist. Während Sie die ruhigen Gewässer durchqueren, bewundern Sie den beeindruckenden Aynalıkavak-Palast, den Galata-Turm und die Eyup-Sultan-Moschee. Etwa 45 Minuten vor Ihrer Kreuzfahrt passieren Sie die Altstadt und fahren in den Bosporus hinein. In den nächsten eineinhalb Stunden Kreuzfahrt zu Istanbuls Top-Attraktionen wie dem Dolmabahçe-Palast, der Rumeli-Festung und Staunen Sie über die Unermesslichkeit zweier Bosporus-Brücken. Hören Sie von Ihrem Reiseführer über die Geschichte dieser Sehenswürdigkeiten und nehmen Sie Fotos von herrschaftlichen Herrenhäusern, osmanischen Holzhäusern und Moscheen auf, die sowohl europäische als auch asiatische Banken begeistern. Als Ihr Boot nach Eminonu zurückkehrt, verabschieden Sie sich von der atemberaubenden Landschaft. Steigen Sie am Hafen aus und beenden Sie die Tour am Gewürzbasar. Wir wurden sehr spät vom Hotel abgeholt. Die Tourleiterin sprach nur schwer verständliches Englisch. Aber die besuchte Moschee war sehenswert und die Bootstour war sehr schön. Allerdings konnte man der Tourleiterin keine Fragen stellen, weil sie irgendwo zentral im Boot in ein Mikro sprach. Die Erläuterungen der Bauwerke waren ohne Zweifel interessant. Ask for Emre as your guide and you will not be disappointed. He has a university education in history and speaks great English. He was the best guide Ive ever had on a tour and I am a person who gets city tours in every city I stay in. Highly recommend this tour for simplicity and time. Wish Id booked a longer one! But I believe any tour with Emre would be packed full of great information. We started off with a rather long drive from our hotel pick up to the Egyptian Spice Market. During the drive Emre told us everything about what we were seeing. Neighborhoods, ancient buildings, how the citizens function and gave many helpful pointers - which you need in Istanbul. It is typical for tours here to take you to a handicraft expert or a reputable vendor and the stop in the spice market was a few minutes to use the WC as well as a fun introduction to a vendor here. Theres no particular pressure to buy but we did since we wanted to anyway. Saved time. The vendor was so charismatic and fun. It was great fun trying so many traditional treats and the tea he made us was delicious. Moved on to the boat - I believe a sight seeing ferry - it is two level. There is a WC. The top level was semi covered which worked well for the cold wind and the need for Photos. They sell snacks but you can get Turkish tea or coffee which is lovely. The views were amazing and the informations day background history and context about what we were seeing was just so valuable! Wish we could have Emre on all our tours! It is quite a complete tour, with overviews of the main spots in the city, along with lots of information both historical and current. The cruise trip is beautiful, I recommend it. However, I do not recommend making any purchases on the quick visit to the Spice Bazaar Egyptian Bazaar since you can find much better prices outside. This tour is mostly useful for a first view of the city, early in your trip. The van tour of the Golden Horn was a tour of the congested highways of Istanbul. We didnt leave the car once. It would of been good if we had planned photo opportunities. This tour also ran an hour late which i was only informed by our guide once we were on the boat on the Bosphoros. I had my flight home booked in the afternoon. Since it ran overtime, it caused me a lot of stress to get to the airport on time. We took the half day Bosphorus cruise and it was all that it promised to be. The guides - both of them - could explain the history of all the monuments which we passed. The ride was comfortable, with enough space to move around and watch both sides. Great trip. It was Fantastic.The Bosphorous was amazing. Had an amazing time. Our guide knew his craft well.